Would you like to visit the Castelo-do-Burro and find out more about our stables? Then we‘d like to invite you on an exciting tour of the farm. 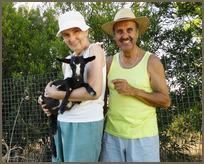 You will be able to enjoy our donkeys firsthand and get to know their typical habits on our bio-ecological farm. 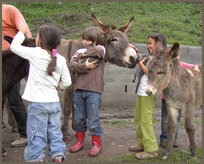 We will be happy to tell you all you would like to know about donkeys and how to look after them. Besides visiting the stables you will also be guided through our fruit and vegetable gardens, the hen house and our dog breeding pound as well as the wild boars in their open-air enclosure in the hills and our small herd of goats. All our animals are friendly and tame. Your children will love them and they will have plenty of opportunity to stroke and touch the animals as well as ask questions. We can offer tours generally speaking only following a prior booking. Normally visits are arranged for Sunday at 9:30am and cost 10 Euros per visitor. The party is however limited from 2 to 12 persons. 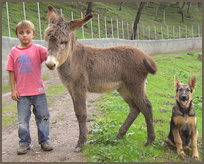 Every child weighing less than 40 kg will have the opportunity to sit on a donkey. The entire tour takes approximately 2 hours and will certainly be an amazing and unforgettable experience for young and old alike.